The Resolute desk is a nineteenth-century partners' desk used by several presidents of the United States in the White House Oval Office as the Oval Office desk. It was a gift from Queen Victoria to President Rutherford B. Hayes in 1880 and was built from the English oak timbers of the British Arctic exploration ship HMS Resolute. Franklin Roosevelt requested the addition of a door with the presidential seal to conceal his leg braces. Many presidents since Hayes have used the desk at various locations in the White House. The desk was removed from the White House only once, after the 1963 assassination of President John F. Kennedy, when President Lyndon Johnson allowed it to go on a traveling exhibition with the Kennedy Presidential Library. After this it was put on display in the Smithsonian Institution. President Jimmy Carter brought the desk back to the Oval Office in 1977, where Presidents Ronald Reagan, Bill Clinton, George W. Bush, Barack Obama, and Donald Trump have used it. George H. W. Bush used the C&O desk in the Oval Office, but kept the Resolute desk in the White House. The original design plan and elevation for the "President's Desk" were created on September 9, 1879. They are now kept by the National Maritime Museum, Greenwich, England and can be viewed online. The National Maritime Museum's September 9, 1879 design plans are drawings for two different gifts proposed by the Admiralty but never executed, a "Secretaire" and a "Library Table". The library table and the President's secretaire were never implemented and these proposed gifts were replaced with William Evenden's 1880 Resolute desk. The Evenden desk delivered to President Hayes does not accord with the plan held at Greenwich except for the order imperative that it "be made from the timbers of the late Arctic Ship 'Resolute'". Proposed Library Table having two Fronts, one for the Presidents use the other for his Secretary. If one Front only is required, then three panels containing Arctic subjects is proposed. A. Front for Presidents use, fitted with six drawers in Pedestals & three drawers in Top. B. Front for Secretary's use fitted with two Cupboards partitioned for Ledgers with drawers under & three drawers in Top. The door panels to contain Busts of H.M. Queen Victoria & the President of America encircled by Laurel wreaths. C. Pedestal ends with two outer & inner panels to contain such Arctic subjects as may be selected. D. Ten Bust Brackets of such Arctic Explorers as may be selected with names engraved on plates fixed on scrolls under. E. Representations of the four Quarters of the Globe on four inner angles of Top Frame . F. National Flags of England & America on the four outer angles of Top Frame. G. Over Busts on the Ends representation of Arctic & Antarctic Circles on Top Frame. H. Handles representative of Friendship, Male & Female, on the drawers. I. Top to be covered in Morocco Leather & embossed to order. The design for the secretaire is the work of a working-joiner employed at the dockyard at Chatham. England, where the Resolute was broken up. The top is covered with morocco, bordered and embossed. The front panels contained carved medallion portraits of Her Majesty and the President of the United States; the side panels, Arctic subjects, also in relief; and the space at the back of the table, corresponding with the front panels, is furnished with a set of six drawers on either side, the handles of which are formed by two hands – male and female – grasping each other, symbolic of the goodwill existing between the heads of the two countries. The top cornices of the eight corner pedestals were appropriated to carved representations of the Arctic and Antarctic circles and the American and English flags crossed, while busts of celebrated arctic explorers support the cornices. 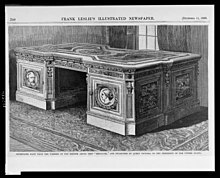 The image and the written description in the newspaper article are not of the Evenden President's Desk delivered on November 23, 1880, but depicts the desk in the Admiralty's September 9, 1879 design plan for the library table. 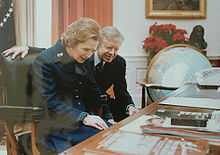 British Prime Minister Margaret Thatcher reads the inscription on the front of the desk in 1979, accompanied by President Jimmy Carter. H.M.S. RESOLUTE forming part of the expedition sent in search of SIR JOHN FRANKLIN IN 1852, was abandoned in latitude 74° 41' N longitude 101° 22' W on May 15, 1854. She was discovered and extricated in September 1855 in latitude 67 degrees N by Captain Buddington of the United States Whaler "GEORGE HENRY." The ship was purchased, fitted out and sent to England as a gift to HER MAJESTY QUEEN VICTORIA by the PRESIDENT AND PEOPLE of the UNITED STATES as a token of goodwill & friendship. This table was made from her timbers when she was broken up, and is presented by the QUEEN OF GREAT BRITAIN & IRELAND to the PRESIDENT OF THE UNITED STATES as a memorial of the courtesy and loving kindness which dictated the offer of the gift of the RESOLUTE. Plaques with similar messages were fitted onto each desk made, the Resolute desk in the White House, Queen Victoria's writing table, and the Grinnell desk. The desk has been modified twice. President Franklin D. Roosevelt ordered a hinged front panel for the knee hole opening in order to hide his leg braces. The panel features the presidential seal—one of only three of the ninety-seven in the White House that have the eagle's head turned towards the 13 arrows in the eagle's left talon, as opposed to the now-official arrangement with the eagle turned towards the olive branch in the right talon with the 13 leaves. The second modification was done to raise the desk by adding a separate, uniform base called a plinth. The first time a base was made for the Resolute Desk was during the John F. Kennedy Administration. This base was made of pine and did not match the desk very well. That base is very visible in the famous photo of John F. Kennedy Jr. playing under the Resolute Desk. In January 1977, President Carter requested the desk be sent back to the White House from the Smithsonian Institution. Photos from January–February 1977 show the Resolute Desk being used with a base, but the base had been removed by late May of that year, when it was photographed without it. White House record photos from early in Ronald Reagan's presidency, one as late as October 23, 1981, show the desk being used without a base. President Reagan requested that the desk be raised higher since he was hitting his legs on the top of the knee hole. The White House's earliest image of the desk with a base during the Reagan Administration is dated August 13, 1982. A new, better-fitting base was built for the desk in 1986, and that base has remained with the desk since that time. Jules Cambon, the French Ambassador to the United States, signing the memorandum of ratification on behalf of Spain in 1899. Queen Victoria visits HMS Resolute, December 16, 1856, the day before the ship was granted to her as a good will gesture. HMS Resolute was part of a five-ship squadron under Edward Belcher sent from Britain in April 1852 to search for the missing British explorer Sir John Franklin, who had left Britain in 1845 in search of the fabled Northwest Passage through the Canadian Arctic. The Western Division of the squadron, consisting of HMS Resolute and HMS Intrepid under Captain Kellett's command, sailed West and wintered at Deally Island off Melville Island. The Eastern Division, consisting of HMS Assistance and Pioneer under Sir Edward Belcher's command, sailed North up the Wellington Channel and wintered near Northumberland Sound. The men spent the autumn of 1852, and the spring and summer of 1853 sledging across the Arctic in search of the Franklin Expedition, as well as the men on HMS Investigator (Captain Robert McClure), and HMS Enterprise (Captain Richard Collinson). After finding and rescuing McClure and the crew of Investigator, Resolute and Intrepid sailed east, but had to winter in the pack ice, gradually moving East all winter. Belcher's two ships moved south in the Wellington Channel before being frozen in again near Disaster Bay. In the spring of 1854 Belcher ordered the abandonment of four of his five ships, and the men gathered at Beechey Island. By the time they were ready to leave, both Assistance and Pioneer had broken free and had traveled 45 miles South in the Wellington Channel until they were only a few miles from Beechey Island. This made no difference to Belcher who was simply desperate to go home. Since he had made his two ships "hells afloat" as he always did, his men were also desperate to leave. However, Kellett only abandoned Resolute and Intrepid under protest. The officers and men returned home on HMS North Star and the relief ships HMS Phoenix and HMS Talbot. As a matter of course in the Royal Navy, all captains who lost ships were tried by courts-martial. And so Belcher was tried by court-martial for abandoning the four seaworthy vessels, as were Resolute's captain, Henry Kellett; Intrepid 's commander, Francis Leopold McClintock; and Pioneer 's commander, Sherard Osborn. All were acquitted. Belcher, however, never received another commission and was scorned by the officers of his court-martial when they returned his sword to him in complete silence. Resolute continued to move slowly eastward in the pack ice, and one year later in the autumn of 1855 she was 1200 miles away from the place where she had been abandoned. In September 1855 an American whaler named James Buddington, from New London, CT saw Resolute adrift in the pack ice off Cape Walsingham in Davis Strait. He split his crew and sailed her back to New London, arriving home on Christmas Eve. Buddington's ship, George Henry, had preceded Resolute, and many were beginning to wonder if Buddington was still alive. The British government waived all claims to the ship upon learning of its arrival in New London. At the time of the salvage in 1855, Britain and America had several areas of active dispute: Britain's territorial claims in Belize, which the United States claimed violated the Clayton–Bulwer Treaty and disputes over fishing rights and the border between British Columbia and Washington Territory. In March 1855, an armed action by Washington Territory officials in the San Juan Islands had raised tensions between the countries. After the Resolute was recovered, Senator James Murray Mason, from Virginia, proposed a bill in Congress for the federal government to buy Resolute, refurbish her, and sail her back to Britain as a present. The bill passed, authorizing more than $40,000 for the work, and President Franklin Pierce signed it into law. Resolute was sent to the Brooklyn Navy Yard, where she underwent a complete refit, and Commander Henry Hartstene USN, sailed her back to Britain, arriving at Spithead on December 12, 1856. After Resolute was towed to Cowes so that the Queen and Prince Albert could tour her, Captain Harstene presented the ship to Queen Victoria as a gesture of peace and good-will on December 17, 1856. Soon the talk of imminent war ceased, and the gift of Resolute was seen as instrumental in the easing of these tensions. In 1856, the United States and Britain appointed boundary commissioners to resolve the San Juan Island dispute. The disputes, however, would continue to flare until the 1860s, with conflict in the Pig War (1859) in the San Juan Islands, and the First Lord of the Admiralty warning that "drifting into war" was still possible in Central America until the Central American treaties of 1859-1860. Henry Grinnell, a New York merchant with an interest in the fate of Franklin's lost expedition, had supported the gifting of Resolute, and along with Lady Franklin had hoped the British would use the ship for a new search for those lost. However, by 1856 the Royal Navy doubted that any of Franklin's men could still be alive eleven years after they entered the Arctic, and declined to support a new search. Nor was the Navy willing to let Lady Franklin use Resolute for a privately funded search. Britain could not risk losing Resolute after the important role the ship had played in smoothing the relationship between her and America. Resolute stayed in home waters until she was taken to the breaker's dock at Chatham Dockyard in 1879. President John F. Kennedy first placed the Resolute desk in the Oval Office in 1961. The desk left the White House from 1963 until President Carter brought it back to the Oval Office. Since then, presidents Ronald Reagan, Bill Clinton, George W. Bush, Barack Obama, and Donald Trump have used it in the Oval Office. Some presidents, such as George H. W. Bush, have used the desk in their private study rather than in the Oval Office. When president Lyndon B. Johnson took office in 1963, he found he was too large for the desk, and instead commissioned a plainer replacement which was built for him by the Senate cabinet shop. Richard Nixon, who succeeded Johnson in 1969, used the Wilson desk, the desk from the Vice President's Room at the United States Capitol, which he had used as Eisenhower's Vice President and believed to be that of former president Woodrow Wilson. Gerald Ford, who succeeded to the presidency in 1974 following the resignation of Nixon, used the Wilson desk throughout his term. Jimmy Carter, Ford's successor, brought the Resolute desk back to the Oval Office, where it remained until George H. W. Bush returned the Wilson desk to the Senate, preferring the C&O desk that he used while serving as Vice President during the Reagan Administration. Bill Clinton subsequently brought the Resolute desk back again to the Oval Office, where it has remained since. In 2009, British Prime Minister Gordon Brown visited President Barack Obama and gave him the original framed commissioning papers for Resolute and an ornamental pen holder made from the timbers of HMS Gannet. HMS Gannet was not a sister ship to the Resolute, as has been widely reported. Her only connection with Resolute was that the Gannet was launched from the Chatham Dockyard, which was the same dockyard where Resolute was decommissioned. Gannet was launched in 1878 long after the cross Atlantic slave trade was made illegal, and also many years after the American Civil War. Therefore, she was not used in anti-slavery work in connection to these markets. She did, however, patrol the Mediterranean Sea and prevented slave trade there. After Resolute was broken up, Queen Victoria asked for several desks to be built from her timbers. Four desks were designed and made by William Evenden. A large partners desk was presented to President Rutherford B. Hayes on November 23, 1880, while a smaller lady's desk was presented to the widow of Henry Grinnell; this desk is now in the New Bedford Whaling Museum. Finally, the Queen had two desks made for herself: one is a small writing table catalogued online (with a photograph showing its plaque) . The second is a smaller writing table which she had made for her private yacht, HMY Victoria and Albert II. The National Museum of the Royal Navy loaned the item for a short exhibition, however the table was returned to the Royal Collection after the loan period ended in 2008. In addition to the items commissioned by Queen Victoria, there is also a corner cupboard with "Relic of HMS Resolute" carved on its apron created from Resolute timbers at the request of Commander Richard Roche (1831-1888), first mate on Resolute during the Belcher Expedition. The 1881 cupboard was commissioned by Roche for his new spouse. It was created for the dual purpose of commemorating Roche's famous ship and his own and his shipmates’ service on it. Roche was a newlywed in October 1878, the year before the Resolute’s breakup, and the gift of the cupboard was made more poignant by his wife's death in October 1882, a year after the cupboard was made. Caroline Kennedy and President Barack Obama examine the desk. President Barack Obama runs around the Resolute desk in the Oval Office. There are exact replicas of the Resolute desk on display in at least six presidential libraries. The desk at the John F. Kennedy Presidential Library was recreated by Robert Whitley. The Ronald Reagan Presidential Library in Simi Valley, California; the Richard Nixon Presidential Library in Yorba Linda, California; the Rutherford B. Hayes Presidential Center in Fremont, Ohio; and the Jimmy Carter Library and Museum in Atlanta, Georgia, include replicas of the Resolute desk. The desks at the William J. Clinton Presidential Center and Park in Little Rock, Arkansas and the George and Barbara Bush Center at the University of New England, Maine were produced by the History Company of Ithaca, New York. A video clip of the desk in production can be viewed at History Company. A few independent museums also display replicas, including The Presidents Hall of Fame in Clermont, Florida, The Quality West Wing Foundation Museum in Corona, California, a children's educational program focusing on U.S. government, history, and the Presidency; along with the educational program there is a replica of the Oval Office available by appointment; the Treehouse Children's Museum, in Ogden, Utah, which features a small-scale Oval Office; and a full-scale replica of the Oval Office open to the public at the American Village in Montevallo, Alabama. Replicas of the Resolute desk have appeared in many movies. The desk was a key plot device in National Treasure: Book of Secrets, in which a secret compartment in the desk contained pieces of a clue to the location of treasure. The film also features another desk made from HMS Resolute, situated in Buckingham Palace, which was made for the personal use of Queen Victoria. Radio and television host Mark Levin commissioned an exact copy of the desk as the centerpiece for his stage set on Conservative Review. Several companies including History Company, Kittinger Company, and Presidents Desk Canada offer replicas for sale. Matthews, Elizabeth. HMS Resolute. Auxilium ab Alto Press: 2007. ISBN 978-0-7552-0396-3. Monkman, Betty C. The White House: The Historic Furnishing & First Families. Abbeville Press: 2000. ISBN 0-7892-0624-2. Owen, Roderic. The Fate of Franklin, Hutchinson: 1978. ISBN 0-09-131190-X. Sandler, Martin W. Resolute: The Epic Search for the Northwest Passage and John Franklin, and the Discovery of the Queen's Ghost Ship. Sterling: 2006. ISBN 978-1-4027-4085-5. Seale, William. The President's House. White House Historical Association and the National Geographic Society: 1986. ISBN 0-912308-28-1. Seale, William, The White House: The History of an American Idea. White House Historical Association: 1992, 2001. ISBN 0-912308-85-0. The White House: An Historic Guide. White House Historical Association and the National Geographic Society: 2001. ISBN 0-912308-79-6. ^ "Resolute Desk". White House Museum. Retrieved February 10, 2016. ^ "Resolute Desk". The White House Museum. Retrieved December 22, 2017. ^ "President's Desk". National Maritime Museum. Retrieved February 11, 2016. ^ "The President's Desk". Retrieved May 10, 2008. ^ "Resolute Desk". WhiteHouseMuseum.org. Retrieved January 7, 2015. ^ "Franklin Pierce: Third Annual Message". www.presidency.ucsb.edu. Retrieved March 6, 2018. ^ a b "San Juan Boundary Dispute | HistoryNet". www.historynet.com. Retrieved March 5, 2018. ^ "The International Boundary Commission first meets on June 27, 1857. - HistoryLink.org". www.historylink.org. Retrieved March 6, 2018. ^ "The Resolute Desk". Retrieved March 8, 2009. ^ "Oval Office History". Retrieved March 8, 2009. ^ "History of the Resolute Desk". Retrieved February 11, 2016. ^ "The Symbol of the Presidency". ^ Quality West Wing. Retrieved December 12, 2011. Wikimedia Commons has media related to Resolute desk. This page was last edited on 19 April 2019, at 05:15 (UTC).